This whole week, Bay Curious is exploring the 11 statewide propositions on the California ballot for a mini-series we're calling "Bay Curious Prop Week." Each day, we're dropping episodes looking at what the propositions are and how they came to be on the ballot in the first place. Below is a transcript of our episode on Proposition 6. If passed, it would repeal SB 1, the gas tax and vehicle fee increase passed by state lawmakers last year. OLIVIA ALLEN-PRICE: I'm Olivia Allen-Price. This is Bay Curious. Election season is here, and if you're anything like me, you wait until a day or two before Election Day to cram on the facts and decide how you'll vote, especially on those confusing California ballot initiatives. Each year I vow to do better, to start earlier, to not wait until the last minute. This is that year. Over the next five days we'll be exploring the 11 statewide propositions that Californians are voting on — not just what the prop is about but also how it came to be on the ballot in the first place. We'll drop a new episode each day. Some will cover multiple props. Some just one. And by Friday afternoon you and I will be hella informed. We're calling it Bay Curious Prop Week. ALLEN-PRICE: First up is Proposition 6, the effort to repeal the state's new gas tax and vehicle fees. It has become one of the top issues for Republicans in California this year. But before we dive into it, let's first understand how the tax and fees were passed in the first place. STATE LEGISLATURE: Colleagues, we are back in session... if everyone would take their seats. ALLEN-PRICE: It's Apr. 6, 2016. The state Senate had already been in session for nearly three hours by the time they arrived at Senate Bill 1. STATE LEGISLATURE: SB 1 is a long-term solution to our transportation infrastructure problem in California. KATIE ORR: I remember that night. It was super late. ALLEN-PRICE: KQED politics and government reporter Katie Orr was there. ORR: And they got the bare minimum number of votes they needed in each chamber to get it through. STATE LEGISLATURE: Ayes 27, nos 11. The measure passes. ALLEN-PRICE: And can you briefly just go through what was SB 1? What were they voting on? ORR: SB 1 was a gas tax and vehicle fee increase. 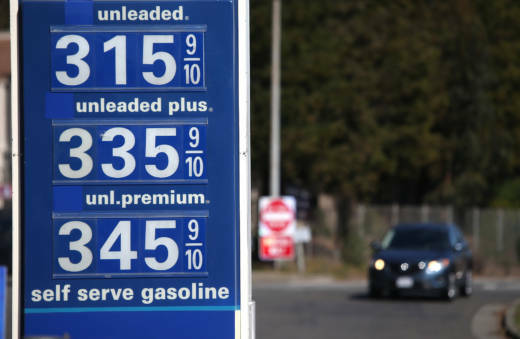 Gas, normal gas that we all use in our cars, went up by 12 cents a gallon. Diesel fuel went up by 20 cents a gallon. And then car registration fees went up between $25 and $175, depending on the value of the car. So all that money together is expected to bring in $5 billion a year over the next decade. And that money gets split between the state government and local governments to fix freeways, bridges, local roads... various infrastructure projects around the state. ALLEN-PRICE: Gov. Jerry Brown was a big advocate of SB 1 and right after it passed the Legislature, he held an impromptu press conference outside his office. GOV. JERRY BROWN: I really want to say, I appreciate being a Democrat and what the Democrats did tonight. ORR: And all the Democrats were crowding around him. You know, everyone wants their picture with the governor. BROWN: The Democratic Party is the party of doing things, and tonight we did something to fix the roads of California. ORR: But it wasn't too much longer after that when we started hearing talk about recall efforts and efforts to repeal this tax. NEWS AUDIO: New at 6 o'clock. A new gas tax is set to go into effect in just a couple of months, but it may not be in place for long if one San Diegan has his way. ALLEN-PRICE: So take me from that room where Jerry Brown is celebrating his big win, the pass of SB 1. You know, what is happening, what are the Republicans doing, sort of, from that moment through today? ORR: So we see an organizing effort by various Republicans to try and overturn this new tax. You saw Carl DeMaio. CARL DEMAIO: C-A-R-L D-E-capital M-A-I-O. Chairman, Reform California, Yes on 6. ORR: He was a former city councilman in San Diego. He launched an effort. They got enough signatures, they put it on the ballot. DEMAIO: The bottom line is we've got the second-highest gas tax in the country prior to this increase and yet we have some of the worst roads. Why is that? Well it's not for lack of money. It's really for lack of accountability. Should voters repeal the gas tax increase passed by state lawmakers last year? ALLEN-PRICE: So we get Proposition 6 on the ballot. What are we voting on? What is in Proposition 6? ORR: So Proposition 6 would repeal the increased gas tax that went into effect in November. So that 12 extra cents on your gallon of gas, that 20 extra cents on your gallon of diesel and those increased fees at the DMV, that would all be repealed. ALLEN-PRICE: But that's not all Prop. 6 would do. KQED transportation editor Dan Brekke explains what else we're voting on with this prop. DAN BREKKE: The second big part of this is that it would amend the state constitution so that any future gasoline tax increases or increases in the vehicle fees would be subject to approval of the voters. ALLEN-PRICE: What would that mean for the future if this did pass and you did have that constitutional change? BREKKE: Well, it becomes politically sort of impossible to get a gas tax increase. I mean, we've had all sorts of what they call ballot box budgeting, and this would just be maybe the most radical example. ORR: So it really takes a lot of power away from the Legislature and puts it back with the voters, which some people would see as a great thing. Legislators tend to think that it would leave them a little bit hamstrung. ALLEN-PRICE: So why has this become sort of the marquee issue for Republicans in 2018? ORR: There was fear, especially in the primary, that they would not have a candidate in the governor's race. So there was concern that it would be Gavin Newsom and Antonio Villaraigosa, both Democrats, in November. If that happens, Republicans don't have a lot of reason to come out to the polls. So they were thinking, 'well, shoot, we need something on the ballot because this is a huge year for the congressional races as well.' There are about seven seats in California that Democrats think they have a really good shot at flipping from Republican to Democrat, and if Republican voters aren't at the polls because they don't have a candidate, then that makes those odds a lot better for Democrats. So fortunately for the Republicans, they did get a candidate into the November election, John Cox. He's a businessman from San Diego, but he doesn't seem to be getting as much traction as Gavin Newsom, and the gas tax is what they're counting on to get their core voters out to the polls. ALLEN-PRICE: Now, even though everyone is talking about this as the gas tax repeal, and they're talking about what you pay at the pump, Dan says it might actually be the vehicle fee increase that people really notice. BREKKE: The fees are steep under SB 1. Your vehicle fee — and then there's a new transportation fee — is based on the market value of your car. So we bought a car last year, and I get my first vehicle registration form in the mail and the fee is over $400. And over $400 at one time, you feel that. Twelve cents a gallon is sort of a slow drip. This is kind of like a big hit all at once. ALLEN-PRICE: The kind of surprising thing is all this fighting might not even matter in a few years. ORR: The interesting thing about the gas tax is we're having this big argument about it, right? But no matter what they really do, the gas tax is going to keep declining because people are getting more fuel-efficient cars, so they need less gas. Some people are getting electric cars — they don't need any gas. So fewer and fewer people are actually buying the gas we need them to buy to maintain the roads. So at some point, they're going to have to come up with a new funding mechanism anyway. And I think if this gas tax is repealed, it would just kind of speed up that process. ALLEN-PRICE: Wow. If this passes, if Prop. 6 passes, what happens? BREKKE: Those taxes and fees are repealed, period, and any future taxes and fee increases will need to be approved by the voters. ALLEN-PRICE: If this doesn't pass, what message does that send? ORR: Well, I think it sends a message that California is facing a lot of issues. I mean, our roads, our cost of living, the increase in the homeless population, and at some point — and Gov. Jerry Brown says this a lot in his speeches — you're going to have to pay to fix it. Like, sorry. That's just the reality of the situation. You're going to have to pay to fix it. ALLEN-PRICE: Thanks to KQED reporters Katie Orr and Dan Brekke for walking us through this one. If you've still got questions about the gas tax, I've got good news for you. We're hosting a Facebook Live on Oct. 10 about the gas tax, and we'll be answering your questions. You can go ahead and RSVP ahead of time, so you'll get this handy reminder when it rolls around. Details at BayCurious.org. ALLEN-PRICE: That's one prop down and 10 more to go for Prop Week. Tomorrow, we're talking about whether daylight saving time should be all the time, how much space animals deserve and our state's favorite topic — water. Bay Curious is made in San Francisco at KQED. I'm Olivia Allen-Price.